With optical brightener. Brightening boost to light up white and grey hair when you need it.With smoothing and strengthening Keravis\ and a touch of Blue Lupin and optical brightener for dazzling shine. 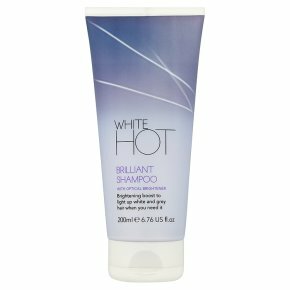 Use once or twice a week or when your grey or white hair needs a super-charged boost of brightness to banish dull and yellowy tones. Directions: Massage into wet hair for a luxurious lather then rinse thoroughly. For the ultimate brightening boost, deeply condition and revitalise hair with Intense Lustre Mask. CAUTION: Harmful if swallowed, avoid contact with eyes, if this happens rinse well with water. May cause skin irritation in certain individuals, a preliminary patch test should be made if you are concerned.